Gone Girl is going to be made into a movie. What this means is that if you haven't read the book yet, you had better get on it. Because I can guarantee you that once the movie comes out, the trailers you see on television will spoil everything for you. EVERYTHING. You can take that to the bank. 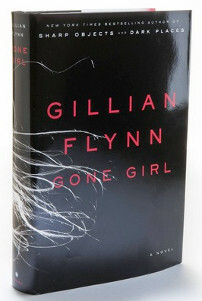 Gone Girl begins on the fifth wedding anniversary of a troubled couple. They met and married and lived in New York City until they both lost their jobs in the media, and had to move back to the husband's small town in Missouri. Things went downhill from there, with financial and emotional strains threatening to tear the marriage apart. And then the husband comes home to find his wife missing, the front door of their home thrown open, and the living room in disarray. As the story unfolds we learn more about the characters, delving deep into their lives while watching the husband say all the wrong things at all the wrong times. And then the surprises begin. This is one of the most spoiler-worthy books I have read in a long time. Everything that's great about the book is great partly because it's a surprise. Which makes this a difficult review to write. I would say that if you want to avoid spoilers - and in the case of Gone Girl you really do - then don't read any reviews other than this one. In fact, just go get the book right now. Trust me, it's good! I don't usually read mass market fiction, crime novels, or books about failing marriages. But everything that bothered me about the first third of the book was instantly revealed to be deliberate in the middle portion. And the final portion of the book was gripping, as we watch the characters slowly spiral in on each other in a life-or-death game of chicken. As a final note, I listened to the audiobook version, and it was outstanding. Both of the performances were perfect, for a text that must have been extremely demanding at times. And the choice to have a man voice Nick's portion while a woman voiced Amy's portion really added a lot to the overall experience.